The south Indian belt comprises of beautiful states like Karnataka, Tamil Nadu, Andhra Pradesh and Kerala. Every state in South India has a lot to offer to its visitors. Tourists come to South India to enjoy a houseboat cruise in the backwaters of Kerala, explore the ancient temples of Tamil Nadu, walk through the historical ruins in Karnataka, experience the colonial charm of Andhra Pradesh and much more. Karnataka is a coastal region full of natural beauty and rich traditions. It is home to dense Nagarhole forests and Bandipur forests. On one hand, the enchanting hill station of Coorg mesmerises you with its natural beauty and on the other hand, the historic city of Hampi transports you back in time with its grandiose historical beauty. Tamil Nadu is another popular tourist destination that boasts of its historical significance, pilgrimage sites, mesmerising sculptures and temple architecture. Rightly called as the ‘land of cultural and religious heritage’, Tamil Nadu gives you ample opportunities to explore our past cultural heritage like no other. Tourists come here to explore the beautiful hill station of Ooty, seek blessings at the famous Meenakshi Temple, explore the creative history of Madhurai, visit the tip of India – Kanyakumari and to witness the architectural splendour of Mahabalipuram. Andhra Pradesh boasts of its pilgrimage spots like Tirumala Balaji Temple at Tirupati, Srisailam Temple in Kurnool and Srikalahasti Temple in Chittoor. These places are known for their exquisitely architectured ancient temples and the beautiful setting. Apart from the religious sites, tourists come here to explore the historical sites like ancient Buddhist site in Nagarjunakonda, wonderful Islamic monuments like Charminar in Hyderabad. Rightly crowned as the ‘God’s own country’, Kerala is a paradise for peace seekers. It magnetises tourists from all over for its pristine beaches, azure backwaters, houseboat cruises, wildlife sanctuaries, laid-back atmosphere, verdant tea and coffee estates, palm-fringed canals, rejuvenating Ayurveda, lush green hill stations and evergreen forests. 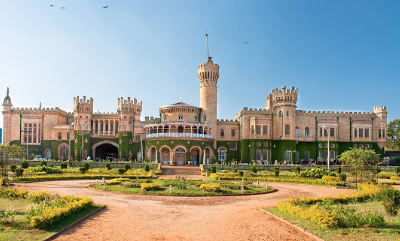 With so much to explore in South India, a vacation in this region requires careful planning and execution so that you don’t miss out any experience or sightseeing location. So, leave it all on us as we plan a perfect itinerary for you which covers everything from cultural destinations to adventurous locations, religious sites to magnificent monuments, beaches to backwaters, exotic wildlife to scenic nature trails. Intersight Tours is one of the most sought after tours and travel company in Kerala. We offer impeccable personalised services and world-class facilities like luxury accommodation, personal chauffeur-driven car, English speaking guides, top of the class amenities and much more so that our customers can have a comfortable and enjoyable tour. So come and book your South India package with us and give us the opportunity to present to you the real taste of South India.